In the late 1700s medical researchers learned that muscular contractions produce tiny electric currents. Research scientists reasoned that a recording of the electric impulses of the heart could reveal irregularities and, hence, heart disease. The Italian biophysicist Carlo Matteucci (1811-1868) observed electric impulses from a pigeon's heart in 1843. In 1856 the German scientists Rudolf Albert von Kolliker (1817-1905) and Heinrich Muller (1820-1864) recorded electric currents produced by a frog's heart. Researchers attempted to develop accurate measuring devices. French physiologist Augustus Waller (1856-1922) found that cardiac currents could be recorded by placing surface electrodes on the body. Waller used a capillary electrometer. This device consisted of tubes of mercury that rose and fell with the changes in heart muscle current. Dutch physiologist Willem Einthoven (1860-1927) set out to design an improved apparatus and in 1903 he described the results, a string galvanometer. The galvanometer consisted of a thin silver-coated quartz wire stretched between the poles of a magnet. As electric current flowed through, the wire was deflected. The magnified motion was projected onto moving photographic film. The extreme sensitivity of the device allowed it to detect the tiny cardiac currents very accurately. An modern electrocardiograph exam. Electrocardiography permits diagnosis of heart conditions without needles or incisions. with his galvanometer. English physician Sir Thomas Lewis (1881-1945) established the electrocardiogram as a standard clinical tool. 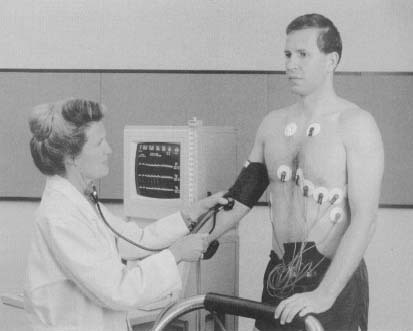 With refinements in instrumentation and technique, electrocardiography became one of the most useful diagnostic tools in medicine. It is highly accurate, easy to interpret, and relatively inexpensive. Electrocardiography permits diagnosis of heart conditions without needles or incisions, and has pointed the way to similar diagnosis of brain currents. besides the impact it made in the medical field what do you think would be the impact on other aspects of society such as the economy or in politics is any at all? Tanks very much for this article. I want to know how to read and translate the ECG result.If you can give examples of a normal and an abnormal diagrams of it, I will so much appreciate it. i am a medical student..
How do doctors diagnose people with heart conditions by using this? what are the differences between electrocardiograph and electrocardiogram?